The new, easy to use, Profoto Connect is a small, lightweight, button-free trigger that seamlessly integrates your camera with Profoto AirTTL lights leaving you free to focus on what’s important, creating beautiful images. Profoto Connect is the button free trigger that integrates your camera and Profoto light making light shaping easier than ever before. Profoto recognizes that for some photographers, capturing images with natural-looking light using flash can be a daunting, complicated task. With the Connect, Profoto has introduced a trigger system designed to help take the guesswork out of lighting, ultimately making it easier for photographers of any level, to create images featuring subjects that are illuminated by beautiful, natural looking light any time and anywhere they want to shoot. 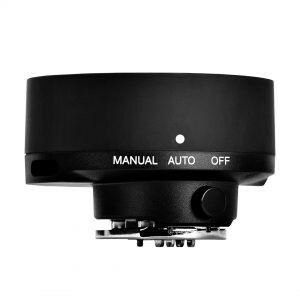 Boasting a minimalist, all black aesthetic, the Profoto Connect ditches control buttons and screens, and instead, uses a simple swivel motion to set the unit to either auto mode, manual mode or to turn it off. When set to auto mode, flash power is calculated automatically, allowing you to just pick up your camera, point and shoot. In manual mode, you have more control to fine-tune settings via the free Profoto app* letting you view/adjust settings with a touch or swipe until you have the light set to your desired brightness and intensity. Using the app in auto mode, will allow you to add an offset to the default flash power for situations where you want to add a little extra brightness or slightly darken your subject without changing any other settings. Whether you’re experienced with created light or just beginning your journey into the world of it, the Profoto Connect makes it easier for anyone to create natural looking, beautiful light with Profoto lights in just about any situation.